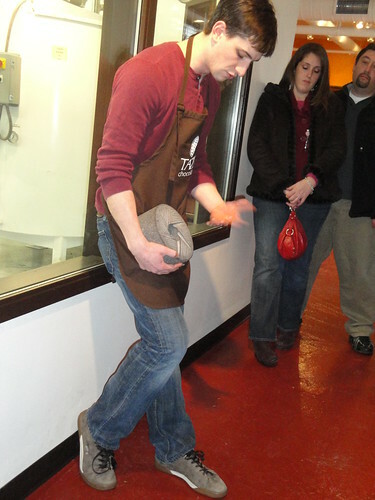 What better way to spend the day before Valentine’s Day then touring a chocolate factory? No, we didn’t see a chocolate river or a single Oompa-loompa. Nor did we see a single red-foil heart-shaped box. On the plus side, we could eat as much chocolate as we could manage, and I daresay it was better than most of the typical Valentine fare out there! 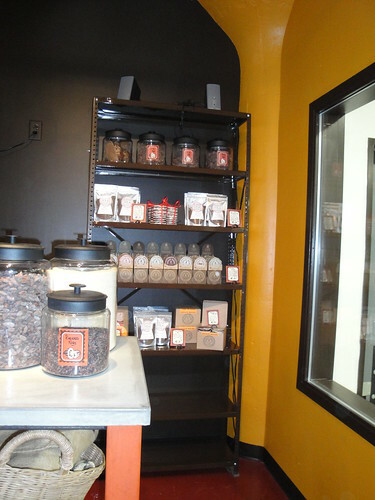 Taza Chocolate is one of only 18 bean-to-bar chocolate makers in the US and they happen to be located right in my backyard – Somerville, MA. Once upon a time, the area was a candy mecca – NECCO, Schrafts, and Brach all made there home here. 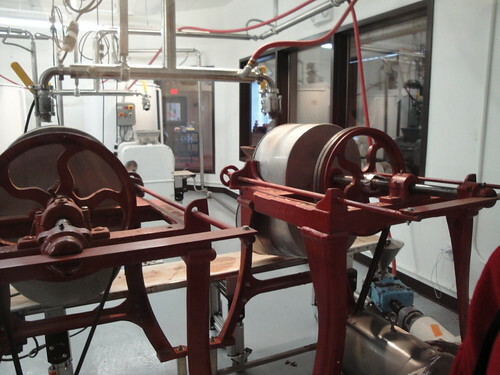 Once, the smell of melting sugar, roasting nuts, and thousands of pounds of chocolate perfumed the air. (If you’re interested in learning more about the hey-day of candy making in Boston, I highly recommend Steve Almond’s book Candyfreak. It covers other old-timey candy as well, but Steve’s a local boy, too, and appropriate time is given to our glory days.) However, it’s been quite some time since those glory days, so it’s exciting to see Taza bringing it back and in such a sustainable and exciting way. 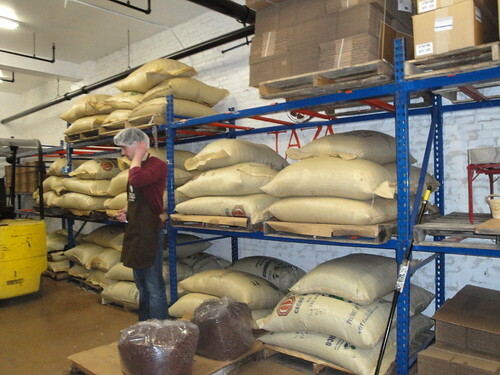 You see, bean-to-bar means that Taza makes their chocolate in a very different way than most chocolate makers (yes, redundant-sounding, but they are NOT chocolatiers – they make chocolate, not chocolate confections). 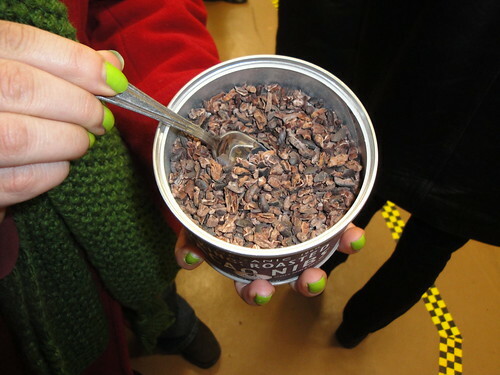 Most chocolate makers buy chocolate mass – cacao beans that have been crushed into a paste – and make their chocolate from that. 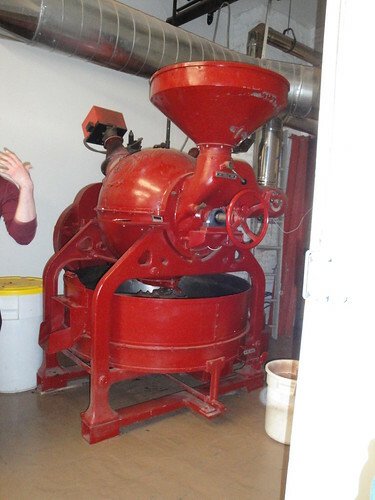 The problem Taza had with this method is that the steps to get TO chocolate mass, namely fermentation, roasting, and the actual crushing, have a lot to do with how the final product tastes. Overdo any of those steps and the product loses quite a bit of the flavors that make chocolate great. So Taza buys beans directly from a cooperative in the Dominican Republic (offering he farmers more money than if they purchased from a middle man! ), and they do the whole process themselves. 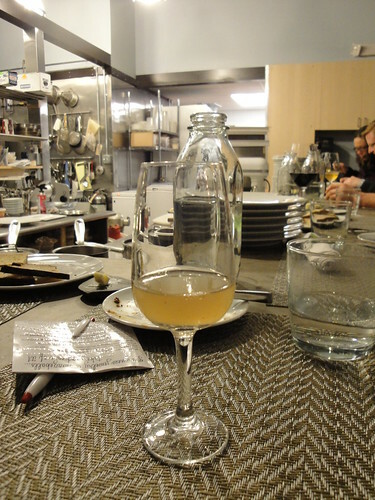 along with a pretty thorough description of the harvesting and fermentation process. 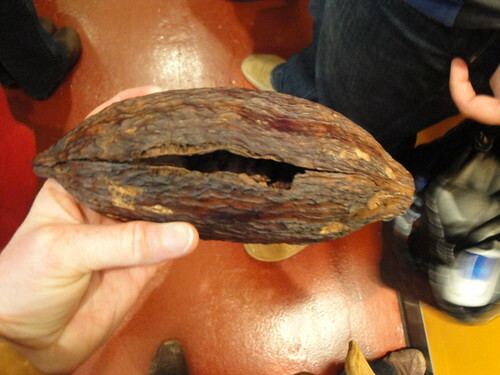 Basically, chocolate is made from the seeds of the big old fruit above, but in order for them to taste right they need to cure by being heaped together and fermenting. 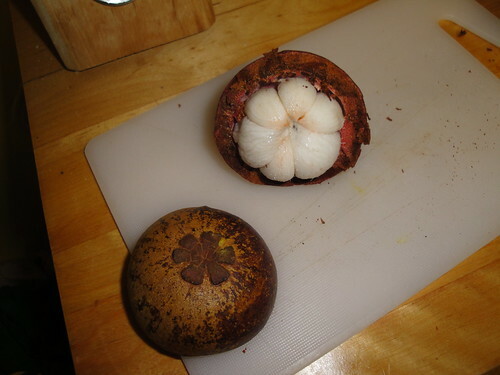 You see, the seeds are covered in a sweet pulp, called baba (literally, spit or drool in Spanish). 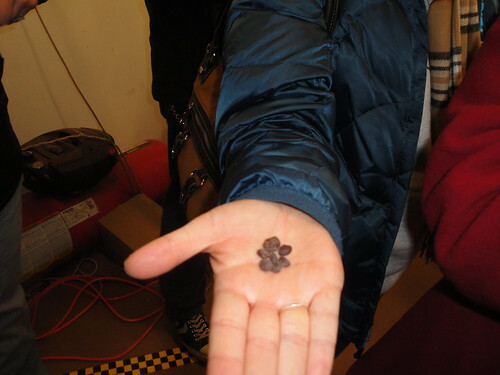 When this pulp is allowed to ferment on the beans, it creates acids that cause enzymatic changes in the beans – this creates the chocolate flavor we all know and love! 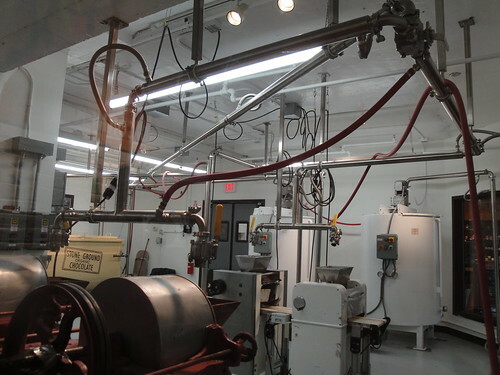 Now the beans can be shipped to America, to be processed into tasty chocolate, and we could finally move out of the anteroom/hallway into which we were squeezed, and into a room where the magic happens! 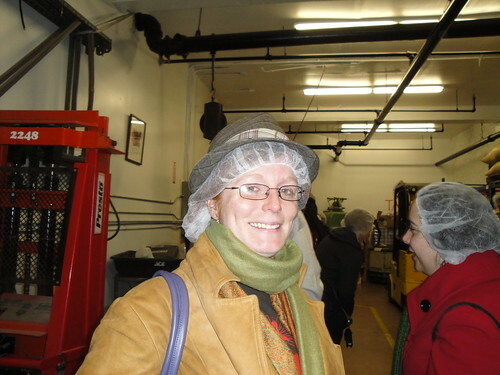 C’est la guerre – the things I do to bring you all the inside scoop on the exciting world of chocolate! I know, I know, it looks like a feed store, but really, that is just chocolate waiting to happen! 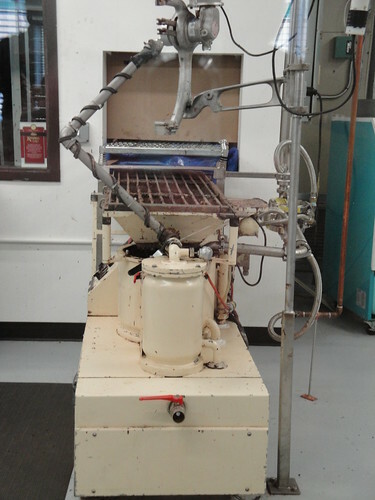 This machine shakes and sorts the beans, removing the husks and shells and generally breaking down into what are called “nibs” – the final step before being turned into what we know as chocolate. 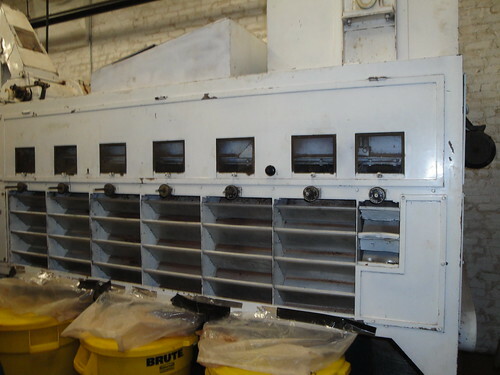 Taza’s winnowing machine holds the distinction of being brought into the factory by hand. Considering that it weighs close to a ton this is no mean feat! 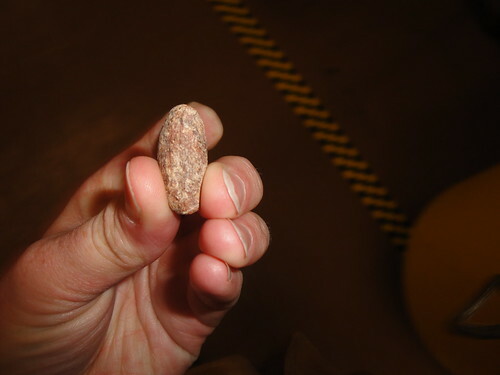 Plain nibs have all of the fruity tones of finished chocolate, but without added sugar they are what some might dub unpleasantly bitter. 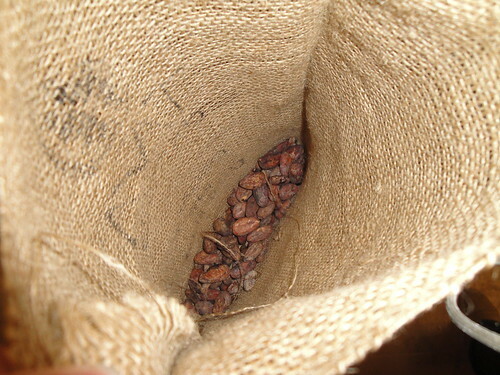 Once the nibs are obtained, we’re finally ready to make some chocolate! To be fair, on the tour this was NOT the room we saw next, due to simple logistics. But I’d rather do it in proper order, because that’s how my brain works. SO! The nibs are taken to grinders, called molinos, to finally be made into the chocolate mass essential to making a bar of chocolate you could eat and reasonably enjoy (although secretly I quite like the bitter nibs). 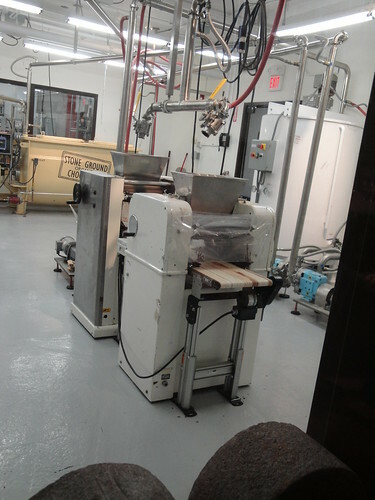 Inside of these machines are stone wheels that grind the nibs together with sugar into a paste. (this is a poured stone sample, but it gives you the gist.) 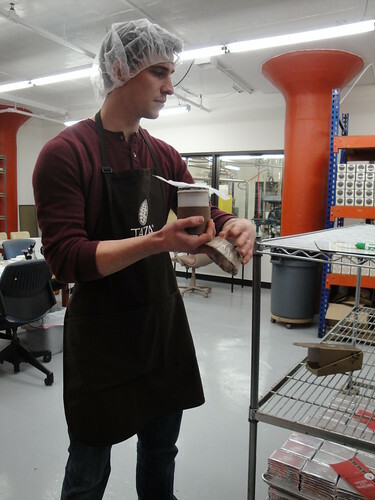 Currently, only one of Taza’s founders has the ability to cut the stones properly so that they line up and grind the chocolate instead of creating friction and burning it. We got the sense that he would very much like to teach someone else to do this task, though to be fair that could just be our tour guide’s interpretation of things. or to the giant holding tanks you see to the right of them. 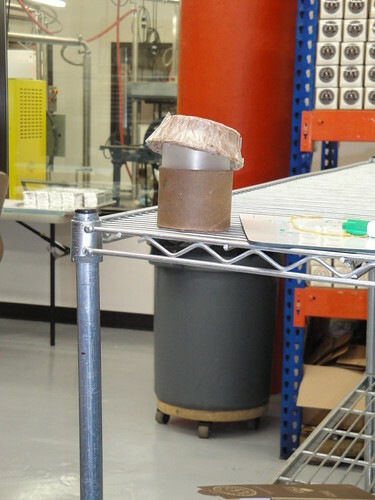 To keep the chocolate moving through the pipes, the room is kept at a balmy 90°+. Since the stone rollers can slip and damage the chocolate, a lucky Taza worker spends six hours a day baby sitting this process! It’s like working in a chocolate-scented sauna, I guess. And with that, Taza has chocolate ready to ship all over the world! The taste of Taza’s chocolate is remarkably complex, proving that the great amount of care and gentle handling they put into it pays off. 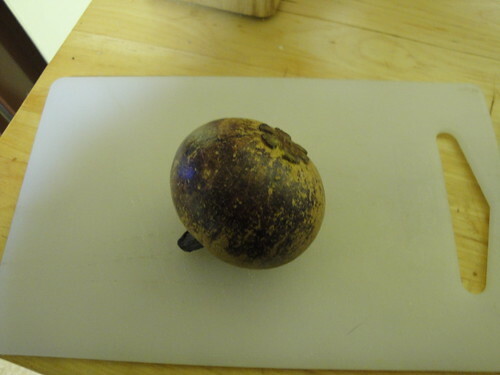 It’s also a bit gritty, thanks to the stone grinding, but I personally find this extremely enjoyable. Since I tend to like the flavors like salt and pepper, which would have a bit of crunch anyway, it’s not a big deal, anyway. 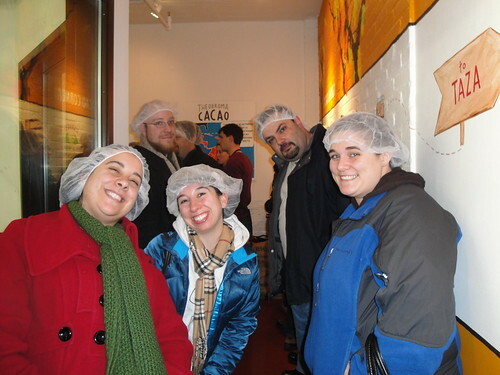 The tour is immensely informative and filled with ample opportunities for free chocolate! If you happen to be in the Somerville area, I highly recommend it. If not, check out Taza’s site for a more complete version of their process, and for heaven’s sake, order some of their chocolate! The flavors they offer are complex and compelling, and you’re supporting a small business that works hard to be sustainable and responsible – a win-win, in my book. I was trying to think of what would be a good blogger name for myself. I thought since I am guesting for The Red Menace, I could be The Brown Menace, since I have brown hair. But that sounds more like something you deal with in Mexico than a blogger. I think I’ll go by “Easy Bake”. It describes both my affinity for the childhood toy that cooks by light bulb, as well as baked goods. I’m sure there are a lot of other meanings that can be extracted from the moniker, but I’ll stick with those two. So, I am here to report on my recent excursion to and throughout Maine with my boyfriend, let’s call him Lieutenant Funyuns. This trip was planned as a birthday present for me. I was told about it last September and had to hold out until May, which was very difficult as I am a fan of instant gratification. But hold out I did. Our trip took us from Cambridge to Acadia National Park, and back. 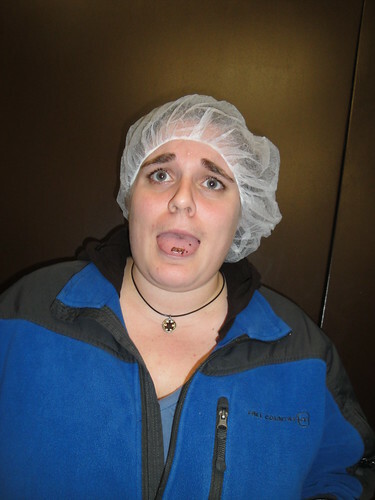 Of course I was excited to see the scenery and explore the wilderness that Maine is famous for, but really, I was in it for the food. We left the wilds of Cambridge on Thursday with the goal of stopping in Ogunquit on our way to Portland. We pulled into Ogunquit without a plan. This was unlike me. For those who know me, know I am a planner. As a child, I started planning my Halloween costume for the next year on November 1st. I always have a plan. This time I did not, and it worked out for the best. We strolled around Perkins Cove looking for a place to eat, almost enticed by the kitschy, touristy vibe of Barnacle Billy’s. But then we saw MC Perkins Cove with a small sign on the door that read: Home of 2010 James Beard Foundation Best Chefs of the Northeast: Mark Gaier and Clark Frasier. Um, yes please! If this place didn’t have spectacular food, it would be worth going to just for the view. But Lt. Funyuns and I both in the Mainey mood ordered fresh, local fish. 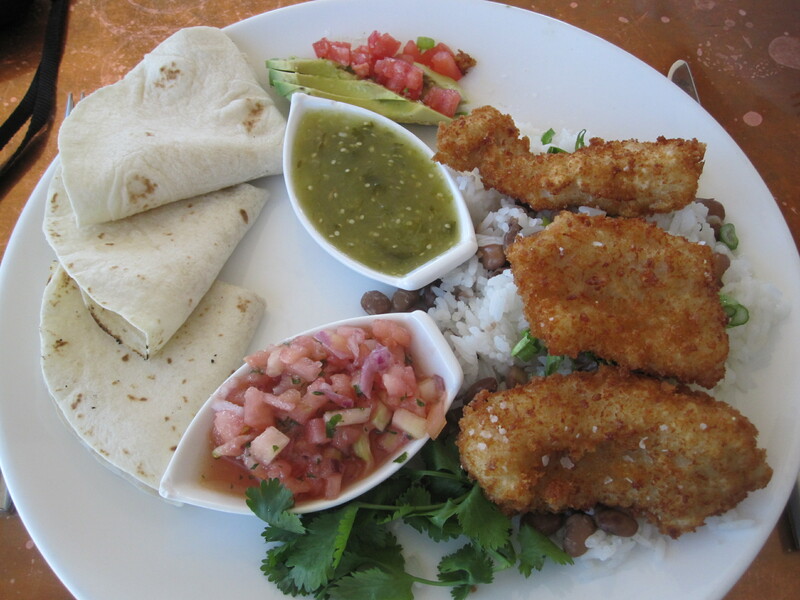 He ordered fish and chips and I ordered fish tacos made from local Cod. Perfection in a taco! 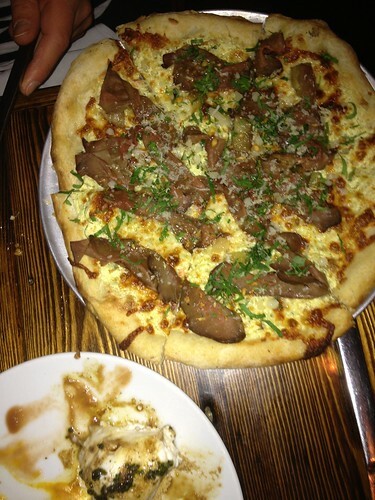 This is on the list to go back to, and visit their sister restaurants. Bellys full, Lt. Funyuns and I made our way to Portland where we were staying in the Old Port district – lovely. My first stop, after dropping our bags in the hotel room, was a quick walk to Two Fat Cats Bakery. A local told me that this was the place to go for cupcakes. I am a sucker for cupcakes. I know cupcakes are so “in” right now. 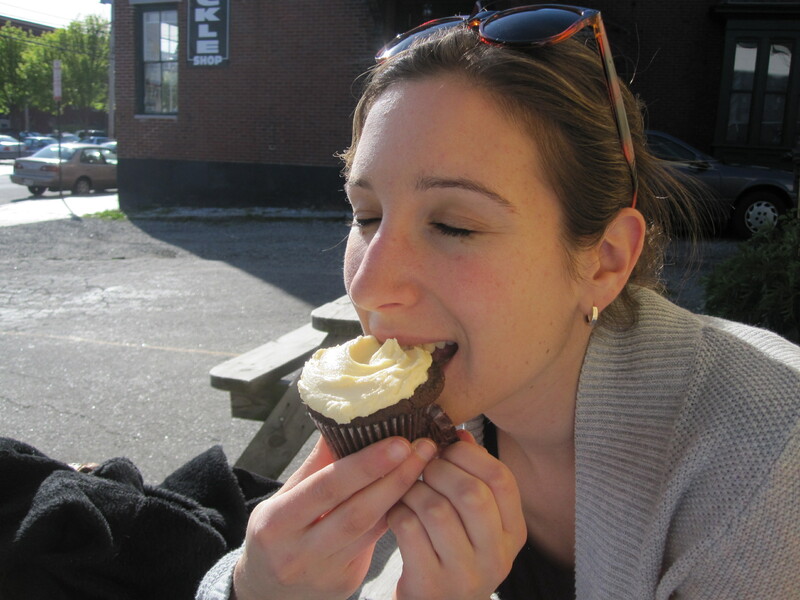 But I am a cupcake purist. I don’t need bacon (no offense bacon) or any other exciting ingredients in my cupcakes. Give me some chocolate cake and some buttercreme frosting and I am like Augustus Gloop in a fudge river. Two Fat Cats delivered. It is a very small establishment across the street from a meat packing facility that apparently just burned down. Had a very pungent smell. But that didn’t matter. I walked in, there was one chocolate cupcake left, and I knew it was meant to be. My mother has this process when she eats Sanders Hot Fudge Sundaes – it’s a Detroit thing – she closes her eyes, and doesn’t let anyone speak to her, that was my experience with this cupcake. We did some other stuff around Portland that day, but really it was all just trying to waste time before our dinner at Fore Street Fore Street is the type of restaurant that I love. 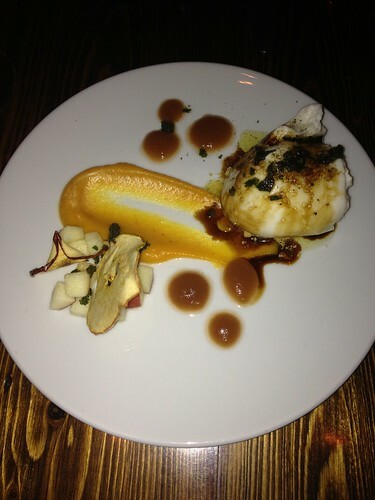 They take pride in their food, everything is local and fresh, and if it isn’t, it isn’t on the menu. They change their extremely extensive menu daily. I have to say, I thought Fore Street was good and not great. I think part of this was because I didn’t do a great job ordering. 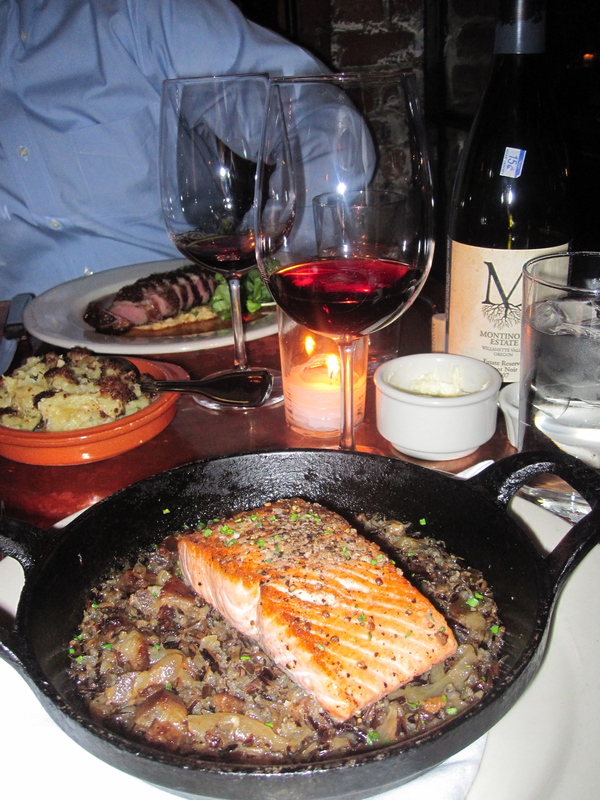 I started off with a salad with shiitake mushrooms – good, and my main was salmon. 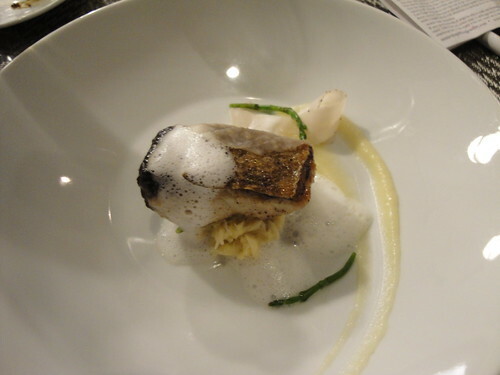 I always have a hard time with salmon in restaurants, I don’t know why, it just is never that good. That said, Lt. Funyuns really enjoyed his meal. 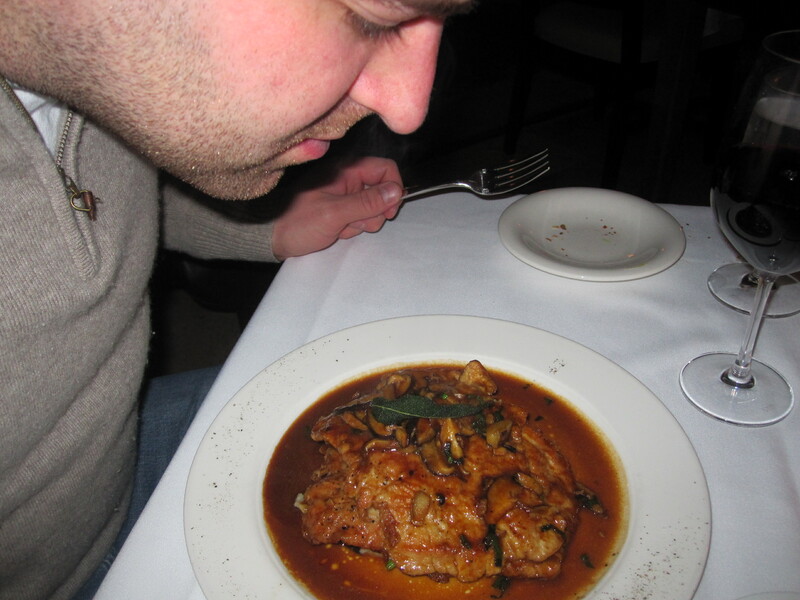 He started with mussels, he actually made me eat two of them, my first two mussels ever, and his main was the duck. He was impressed, and Lt. Fun. is a tough boy to impress. 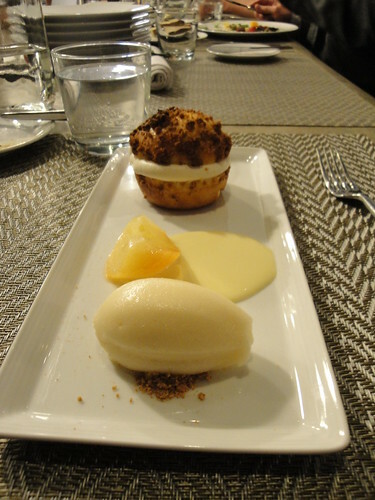 The ambiance and service was grand, so overall, recommended. PLUS, our homeboy (waiter) Lance gave us the inside scoop on what to get for breakfast the next day, so to him I am eternally grateful. Friday morning we started our drive up to Rockport, our home for the next two days. However, not before we stopped at the other recommended bakery in Portland, Standard Baking Co., which coincidentally is directly below Fore St. Holy Macanoley, this place was the shiz. 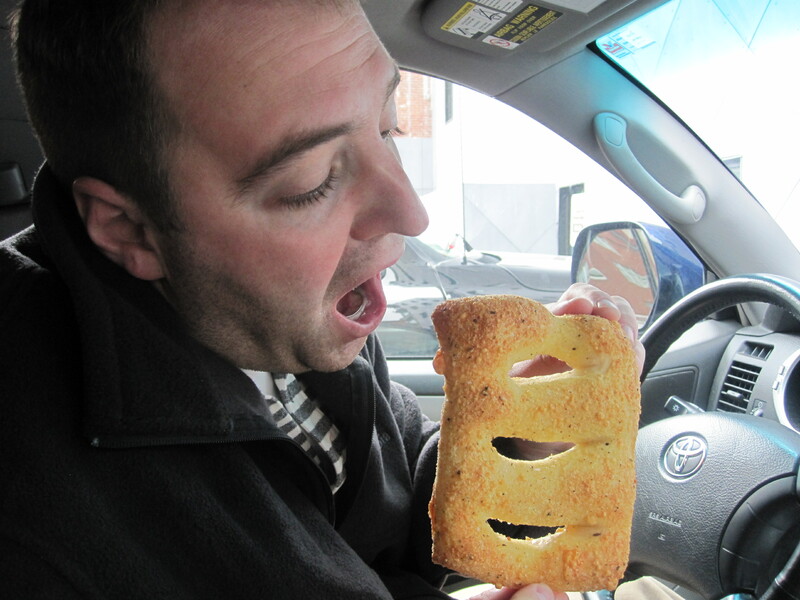 As I mentioned, Lance recommended the fougasse. He said this word like I was supposed to know what he was talking about. I did not. The fougasse is a bread product that is shaped in a ladder. Why? I don’t know. I suppose I could wikipedia it, but this post is long enough already. (Editor’s note: click the link!) It comes in different flavors, Lt. Fun. got the Asiago cheese and I got Sesame and Poppy seed. 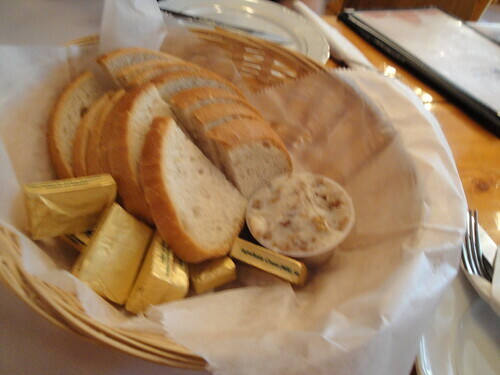 If there is a patron saint of butter, I would like to show some sort of gratitude in whatever way you do to saints (I’m a Jew, we don’t do saints). This was amazingness in a way I can’t describe. Just get one. We did some non-food related activities in Rockport, and then the next day made our way up to Acadia and Bar Harbor. Unfortunately I do not have food adventures to report from there, (Jordan Pond House was closed) but it’s a good place to go to if you’ve been eating your way across the state and might perhaps need a hike to burn some calories. Saturday night we had reservations at Primo, back near the hotel in Rockland. 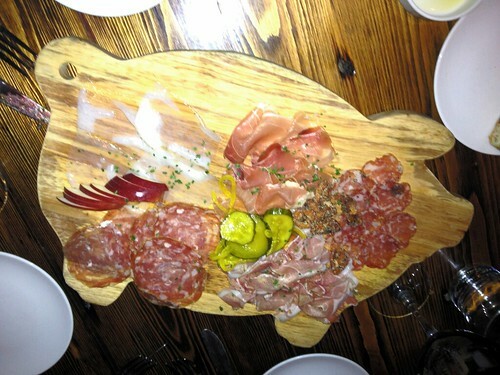 I learned about Primo from the New York Times, said it is one of the best restaurants in the state…I concur! First of all, it is beautiful. Primo is in an old house, that feels welcoming and warm. The staff feel like they have been your best friends since second grade, but just went to school for food instead of Mason-Rice Elementary School. 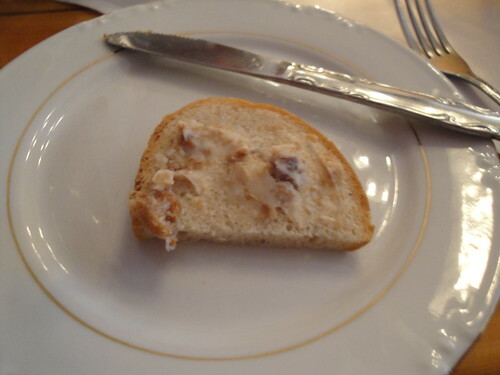 The bread – delicious, but then…then an AMUSE BOUCHE! 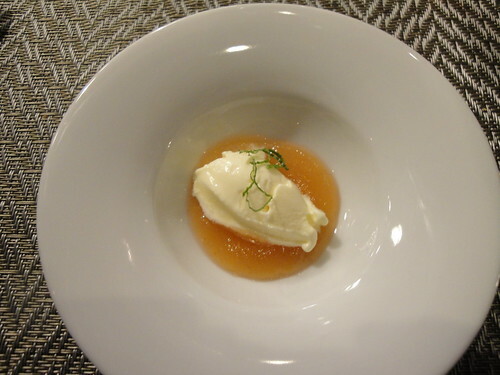 Of course I know what this is from all my years of studying Top Chef. 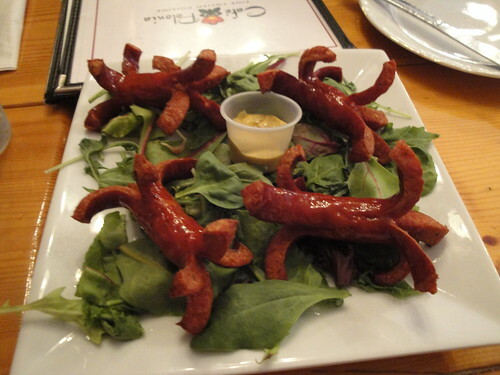 I casually explain to Lt. Funyuns it is a precursor to the appetizer, literally to amuse the palate, a gift from the chef. 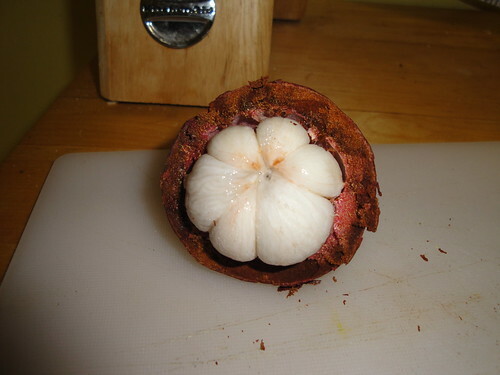 I swear to god this one bite is the best thing I have tasted all trip. 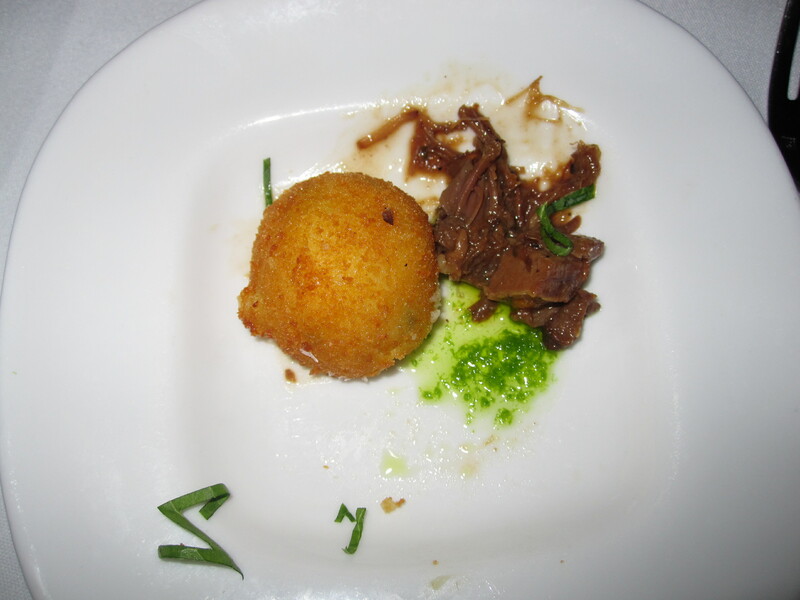 It is a potato croquette with short rib marmalade. It tastes like the lightest, fluffiest, cheesiest tater tot you can image. Then I got the farmer’s salad which comes with a poached egg and bacon – perfection. 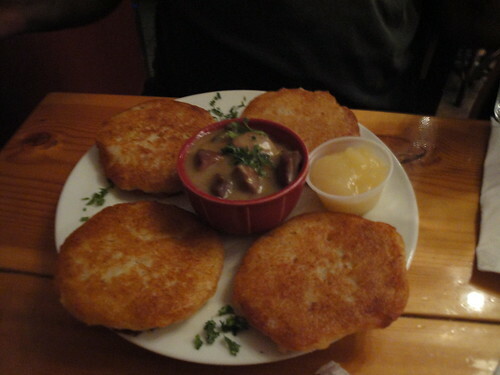 Lt. Funyun ordered olives stuffed with sausage breaded and fried for his starter. 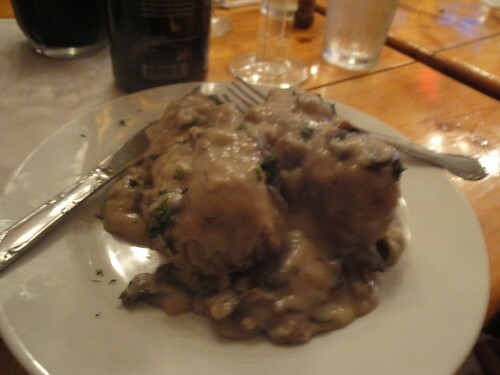 For his main he had the Pork Saltimboca, which came with garlic, mashed potatoes. This man is a mashed potato fanatic, and when he says “Judas Priest, these are damn good potatoes!”, I know they’ve done something right. I got a pasta dish with fried eggplant, fresh tomatoes, some sort of salty cured pork, and other sorts of deliciousness. 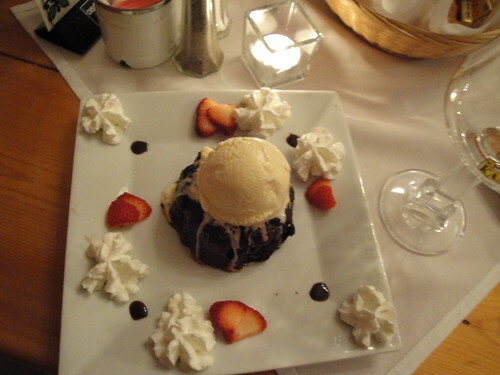 I wasn’t going to order dessert, but my best friend, waitress dimples, convinced me (she was good). 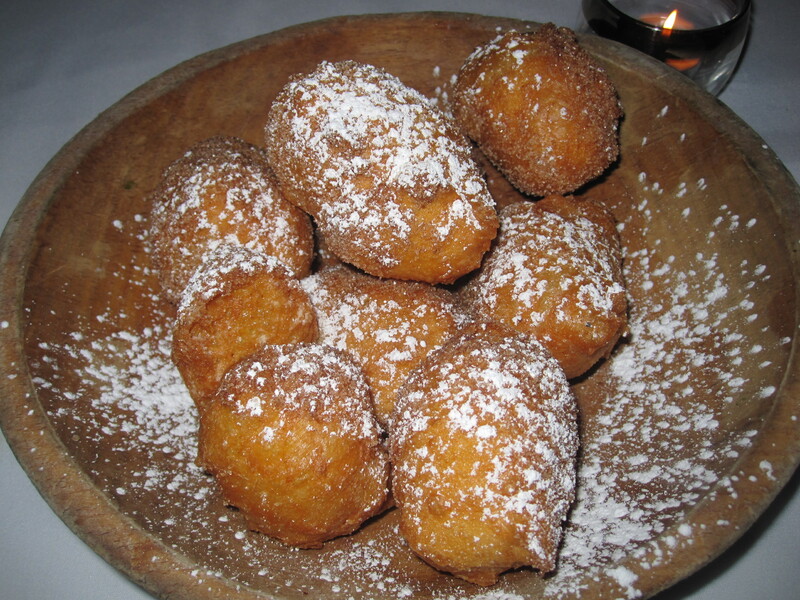 I ordered the Zeppoli, which is basically Italian Fried Dough balls covered in cinnamon sugar – commence drooling. I did this even knowing I was planning on getting the Beignets the next day, but I was unstoppable, and once I took my first bite, I didn’t regret it for a second. Lt. Funyuns and I often like to go through our many experiences at fine eateries and compare them. We did that again on this night. Primo unexpectedly shot to #2 on our list of Best. Meals. Ever. 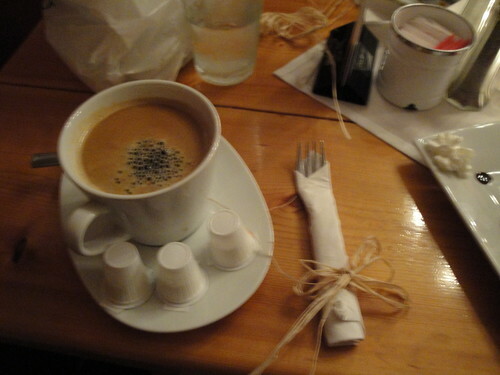 Second only to Craft in New York, which can only be explained by divine intervention. If you are ever, anywhere near Rockland, Maine, go, go, a thousand times, go. So that brings us to our final day in Maine. The day I saved my jeans that are one-size too big for, but on this day felt surprisingly snug. 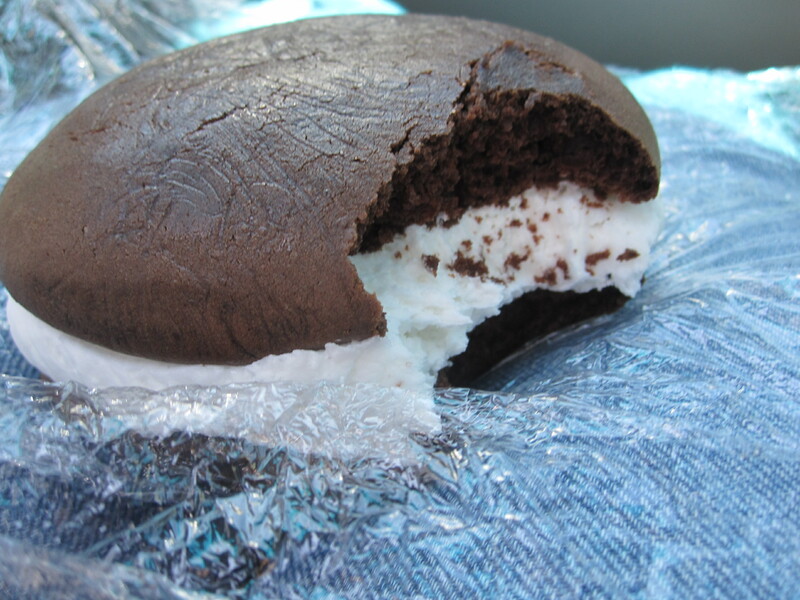 One of my goals had been to get an authentic Maine Whoopie Pie. On our drive back down Route 1 we stopped in at Moody’s diner and snagged a cream filled wonder. I am actually snacking on it now as I write this. You would think I would have had enough, but no, Easy Bake is insatiable. Our final stop in my quest to raise my cholesterol 50 points three days before my yearly physical (not kidding, the weigh-in should be fun), was at DuckFat in Portland. Two of my best pals, Fred and Baby Panda have been raving about this place for years, it was only fair to them that I check it out. We got a table outside, again across from the burned down meatpacking plant, and ordered up a large fries with truffle ketchup. Those people know how to do fries! They were perfectly cooked, some crispy, some soft, but none undercooked which really is my pet peeve when it comes to fries. And here comes my confession…I did not have the Beignets! After the cupcake, and the fougasse, and the Zeppolis and the Whoopie pie waiting for me in the car, I just couldn’t do it. But the way I look at it, now I have a reason to go back. 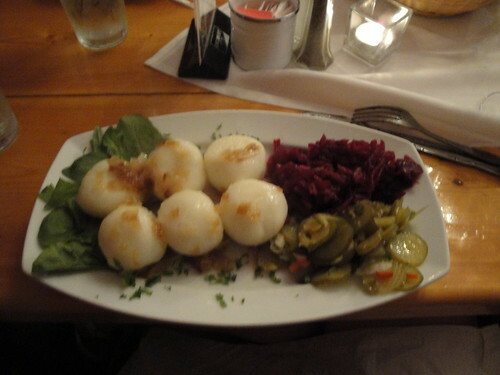 Thank you so much to the Red Menace for suggesting I document this trip as a blog and graciously allowing me to post it on her fabulous Foodie blog! 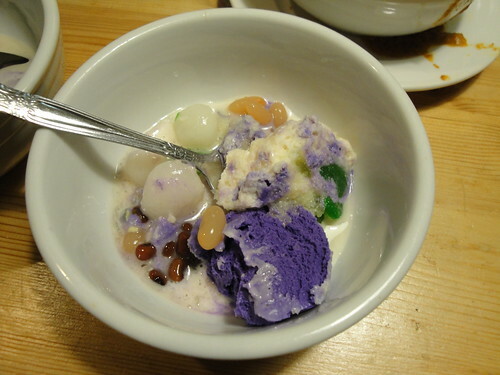 You Say Goodbye, I Say Halo-Halo! Promptly after this Saturday’s 17 mile run I showered and hustled off for a date with some of my favorite adventurous foodies – Jess, Elise, Dan, and Valerie! All four of these folks have been on hand for several adventures, including chowing down on such delicacies as grasshopper and pig’s feet, so I knew I could count on them for the first true adventure of 2010 – Filipino food at JnJ Turo Turo! The adventure begins with getting there, because JnJ is out in Quincy, the farthest reaches of the Red Line. Luckily, Valerie generously provided the use of her car, and after a bit of trouble with the GPS we were well under way. JnJ is tiny – just two six-tops and three tall bar tables that are meant for two, but around which four people could squeeze, if they were determined. Luckily we were able to snag one of the six-tops fairly quickly. The restaurant is family-run and very informal; orders are made by going up to the register and finding out what’s available. The young man behind the counter was great – he asked if we’d ever had Filipino food before, then helpfully told us what was in every dish without trying to discourage us if it had something in it that was not to traditional American tastes. We ordered nearly everything on the menu between the five of us, deciding to eat family style. 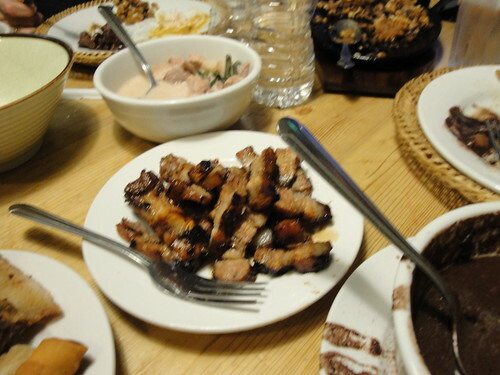 Before I go into what we had, a few notes on the cuisine of the Philippines. As the restaurant itself says, Filipino food is truly fusion – the influences range from its own Malayo-Polynesian origins to Spanish, Chinese, Thai, and American. What’s amazing is how well everything works together – unlike many fusion cuisines where the parts still feel disparate (ooh, the coconut milk is Thai, the spices are Spanish) everything here melded into a unique cuisine. 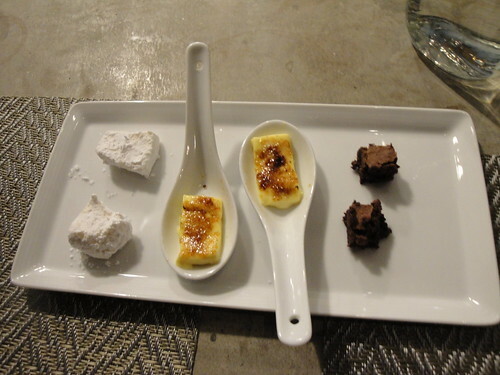 Everything came largely at the same time, so here’s the breakdown by what’s roughly appetizer-like, what seemed to be an entree, and our final and delicious dessert. Warning: large amounts of pork product ahead! 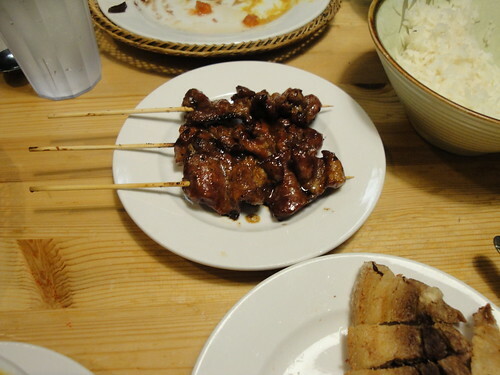 The liempo, or grilled pork belly, was also barbecued, but not as smoky. 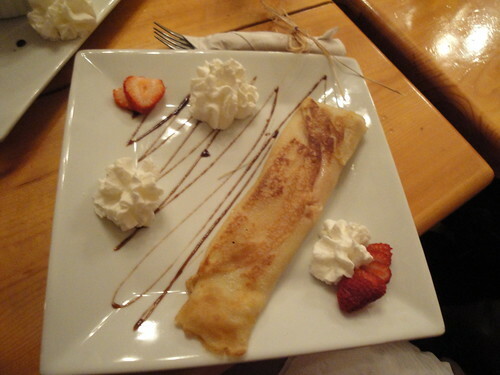 I could have happily eaten this little bits of fatty goodness all day long. 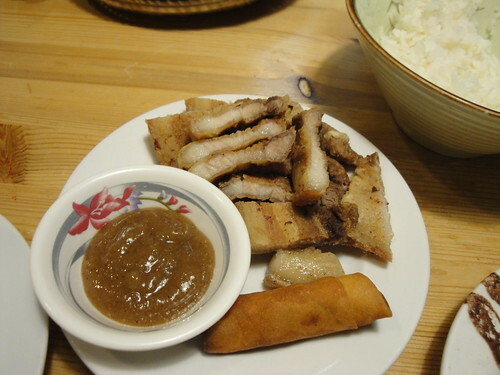 In another take on pork belly, the lechong kawali is fried and served with banana ketchup. 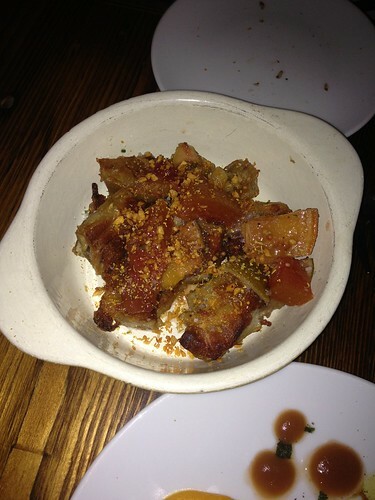 This is like the plumpest, meatiest pork rind you’ve had in your life, and the sweet ketchup only makes it better. 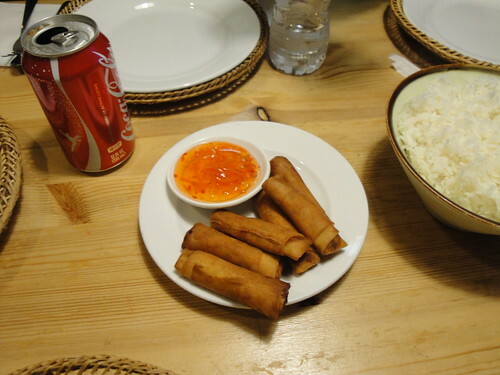 The Lumpiang Shanghai is similar to the spring rolls it’s based off of – thin dough wrapped around meat and vegetables. The main difference was in the thickness of the meat – it was almost as if it were filled with pork meatballs – and the chili dipping sauce they came with. 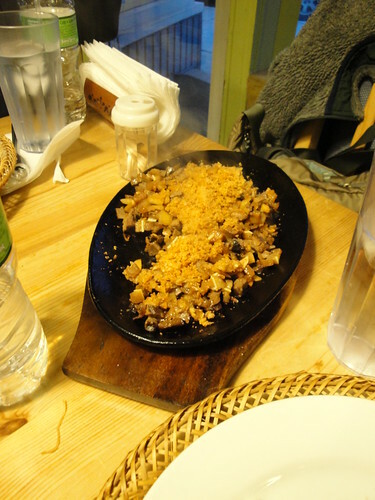 For main dishes, we were all excited to try the Sisig, a mixture of finely diced pork, pig ears, and liver, seasoned with hot pepper, ginger, and lemon and topped with something amazingly crispy that I could only guess was chopped peanuts. 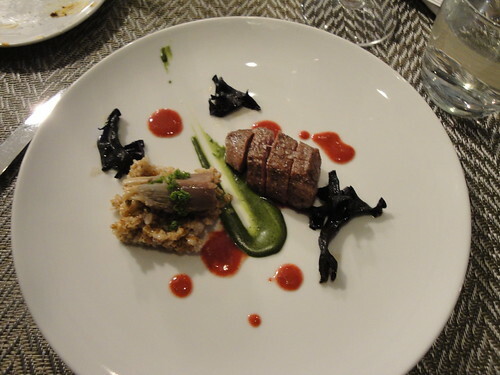 The textural contrasts were fun – soft liver, chewier ear and tender pork bound together with the slight sourness of the lemon. We did order the pinakbet, a lovely vegetable stew filled with okra, eggplant, squash, and string beans, so do not be concerned that this was an all-meat meal. 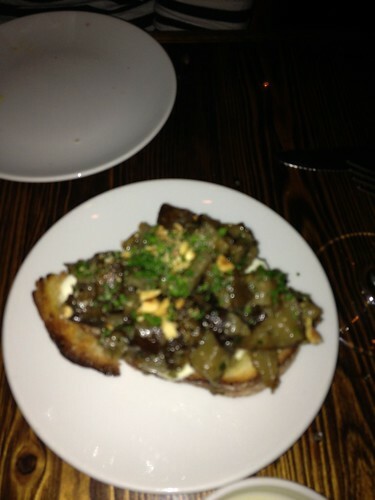 Alas, I somehow neglected to take a picture of it. Be assured that the vegetables were cooked to perfection. That said, we ate more meat still! 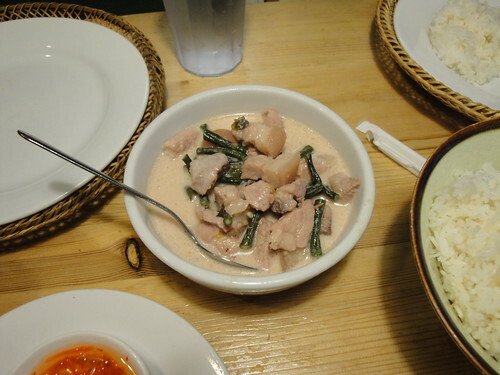 The Bicol Express was another pork dish, a stew of coconut milk, shrimp paste, and green beans. The pork was extremely tender and the combination of coconut and the fishiness of the shrimp paste was unlike anything I’d ever had before – I’m so used to Thai coconut curries that the shrimp was pleasantly surprising. The shrimp paste came into play again in the kare kare, a stew of beef (ha, NOT pork! ), beef tripe, and bok choy in an incredibly thick peanut sauce, with the shrimp paste on the side to stir in as you please. 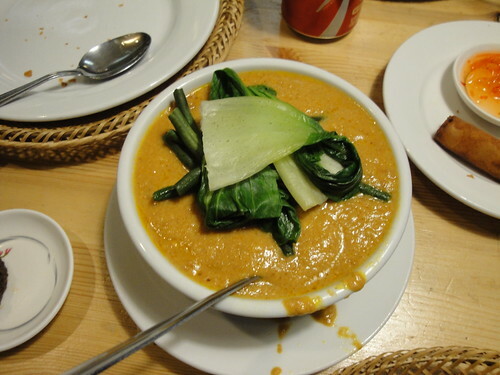 While I’m normally not a fan of tripe – I find it slightly chewy and pointless – in the peanut sauce it was just exceptionally tender, a good counterpoint to the beef. To be honest, though, I think you could have coated my shoe with that peanut sauce and I would have told you it was amazing. 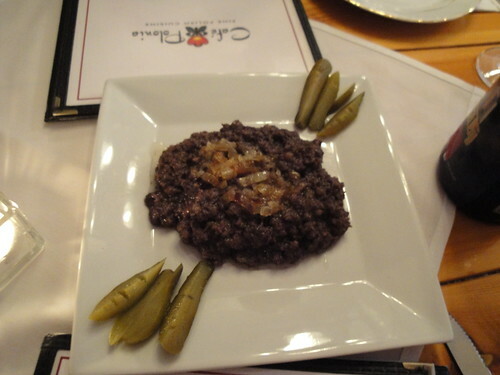 My favorite entree of the evening, however, was the item I came to Quincy specifically to try – the dinuguan. 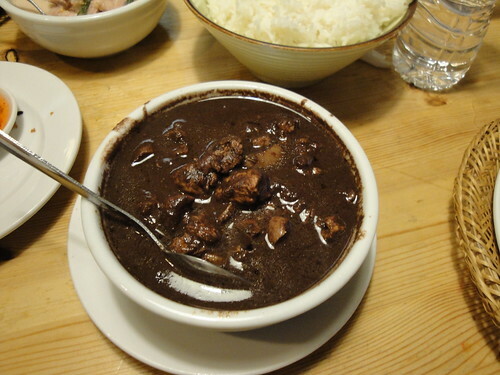 This another stew, filled with bits of pork – traditionally snout, ears, and other entrails, served in a savory sauce of garlic, chili, vinegar and blood. I know that the more squeamish of you are probably a bit skeptical of my enjoyment, but seriously, this stuff is amazing. 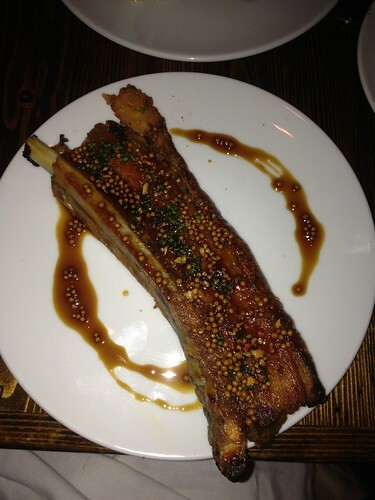 The meat is really secondary to that sauce – salty and garlicky, with the vinegar providing enough acid to cut through the richness of the blood. The big bowl of steamed rice they provided us was a perfect bed for it. 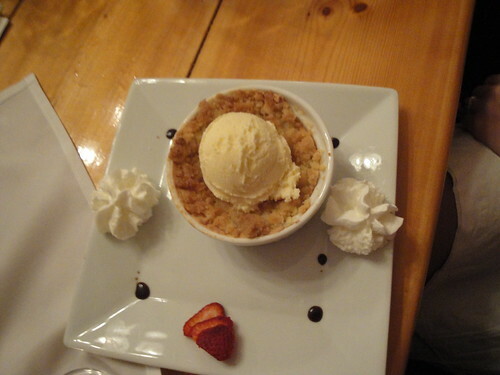 After all of that, you’d think we’d be finished, but dessert was calling our names. Specifically, we were determined to try the halo-halo, a mixture (halo means mix in Tagalog) of crushed ice, milk, sweet beans and fruit. I’d had it once before, but JnJ adds a secret ingredient that blows the other kinds I’d had out of the water – purple taro ice cream. In addition to how visually stunning that purple is, the ice cream oddly reduces the sweetness a bit – the other ingredients have a syrupy quality that can be overwhelming, and the creaminess of the ice cream tones it down appealingly. 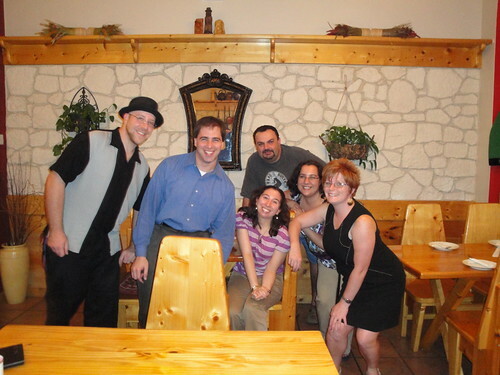 All in all this was a tremendous experience – the family who runs the restaurant was incredibly friendly and helpful, and the prices are very reasonable. It’s well worth the trip out to the ends of the earth – a good thing, as it’s the only Filipino restaurant in the Boston area! After we all went on an Asian market adventure, but that’s a story for another time. 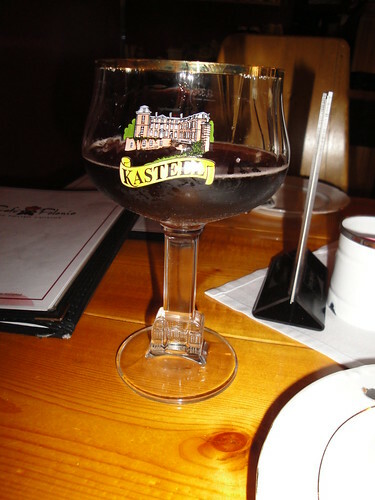 In the meantime, be sure to check out Elise’s blog for her take on our trip!